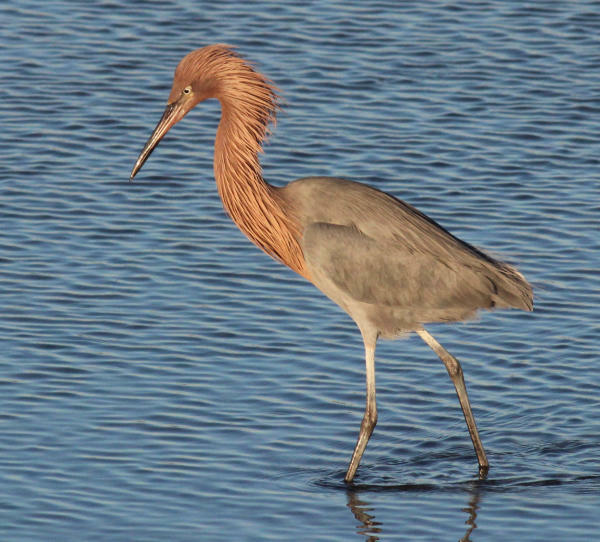 Among the many exciting rare birds reported continent-wide last week, birders found a Reddish Egret in southwest Utah. After last week, it’s surprising to report that there were no first state sightings, but there were plenty of exciting rare birds to report. Birders in the Bering Strait west of Alaska found two Asian species: A Taiga Flycatcher on St. Paul Island in the Pribilofs, and on St. Lawrence Island a Willow Warbler was sighted at Gambell, which has become a fairly reliable location to find Willow Warblers during recent autumn seasons. Another island, Hawai’i, hosted another Asian species, a Ruff, which was recorded at Waikoloa on the northwest coast of Big Island. On the West Coast, an immature male Broad-billed Hummingbird was visiting a feeder in Bolinas, California, northwest of San Francisco. Broad-bills are a Mexican species that ranges across the border into southeast Arizona and southwest New Mexico, but they are rarely seen so far north. Farther inland, Utah birders found a Reddish Egret at Sand Hollow State Park in southwest Utah, and an off-course Long-tailed Jaeger in an extremely un-jaeger landscape, the Cisco Desert in eastern Utah. Even farther away from an ocean, Kansas birders found two different Parasitic Jaegers this week, one at Cheyenne Bottoms in central Kansas and another at Clinton Dam in northeast Kansas. A North Dakota birder found a Townsend’s Warbler in Minot, and would you believe a Swallow-tailed Kite was observed in southwest Michigan? Believe it. In Canada, another Asian shorebird was recorded in Delta, south of Vancouver, British Columbia, along with the second Snowy Plover in as many weeks in the province – two rare shorebirds in one cityscape! Plus a White-winged Dove was photographed at Port Renfrew, on the southwest coast of Vancouver Island. Birders in southern Quebec found a Fork-tailed Flycatcher in Normandin, which is a far cry from the normal range of this Latin American flycatcher. A couple European visitors, Little Egrets, continue to be seen in New England, where a single individual continues to fly back and forth across the border of Connecticut and Rhode Island, and the long-visiting Maine bird continues to provide sightings for birders who trek to Scarborough Marsh. A Thick-billed Vireo was reported in Florida again. It’s exciting to find out what rare birds are found each week across North America! What will birders find next week?